Real wood blinds are made of finest woods such as oak, cherry, and basswood. As these are made of natural wood, they can stand up to direct sunlight and can heat better as well. The natural wood will have moisture. Therefore, it needs to go through different drying processes. Wood blinds can be ideal for all windows except high-humidity areas such as the kitchen sink, bathroom sink, and your laundry windows. The moisture can affect the performance and longevity. With real wood, you can expect better light control, privacy, and energy efficiency. You can install wood blinds in family rooms, bedrooms, living rooms, and dining rooms. Wood blinds are ideal for all those who love the warmth of real wood and many rich color choices. These are lighter and durable. In addition, these blinds will not warp and fade from heat and sun. As real wood blinds need less support, you can use less visible strings. These are not real wood. These blinds come as a combination of polystyrene, Poly-vinyl chloride, and some other additives. The core is plastic that comes with additives to ensure a durable result. The additives work best to prevent warping. When it comes to the warping, the composite woods are more susceptible, they warp badly. However, some suppliers offer a limited lifetime warranty. During the warranty period, the blinds will not warp, fade, or crack. If it happens, you can get a replacement. These blinds can work best in high humidity areas. These are easy to clean and maintain. You can simply clean composite wood blinds with a moist cloth. You can use these blinds in your kitchen, washrooms, and laundry. Composite wood blinds boost the curb appeal. Rapid Blinds says that these are sturdier and heavier. You can split the big one into two. These are affordable. If you are looking for good quality and a less expensive material, then you can think of this option. These blinds are made of Poly-vinyl Chloride. The benefit of this material is the price. You can expect durability and fire resistance ability. The downside is that this material cannot withstand high temperature. It will be pliable and soft when the temperature will be above fifty-five degree Celsius. You can use faux wood blinds in high humidity areas such as kitchen sink windows and bathrooms. With faux wood, you will get the look and feel of real wood at your budget. If you buy from a good supplier, you can get a warranty on fading or warping. Now you know all the types and their possible advantages and disadvantages. You can choose the one depending on your budget, type of areas you are living, and the place you are going to install the blinds. 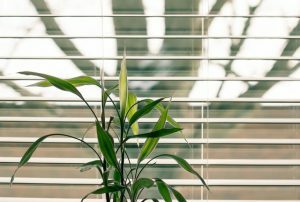 You also now know the answer to “do wood blinds warp in the sun”, and hopefully this article helped you come to a conclusion.